Some people have tried to downplay how awesome capes are by claiming that they can get you all tangled up while trying to fight bad guys. Well, Superman never seems to have that problem. He's put the smackdown of evildoers for nearly 100 years and his cape just flows valiantly into the sky. This Adult Deluxe Superman Cape lets you get a taste of that awesomeness and lets you stick it to the naysayers with style. What does Clark Kent do when his spandex suit is in the wash and he needs to fight some bad guys? 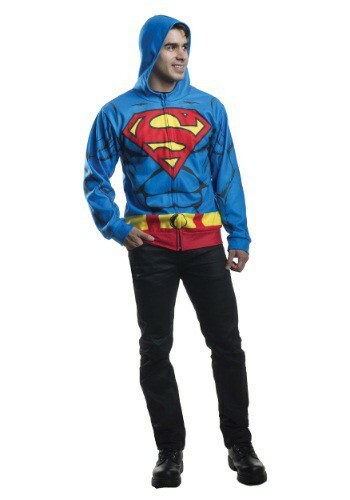 He busts out this Adult Superman Costume Hoodie. It has all the details of his superhero gear, but it's all packed into a comfortable hooded sweatshirt design. That means he can wear it while fighting Lex Luthor, or when he's taking a walk in the park. Don't just sit around and wait for your kid to get superpowers! It's time to be proactive about his dream of being a superhero and with this Superman t-shirt, it's that much closer to a reality. The best part is, if his dream of being a superhero doesn't work out, it's a pretty sweet t-shirt that he can wear to school. Normal people generally don't wear capes these days. Of course, Superman is anything but normal and neither is your child! That's why he can totally get away with wear this Superman cape to school, the grocery store or even to a fancy dinner party. Alright, so maybe that's stretching it a bit, but he'll certainly look pretty cool wearing it when he fights bad guys, even if they are only imaginary. Look! Up in the sky! Is it a bird? Is it a plane? No, it's your child in this Child Classic Superman Costume! He may not actually be able to fly faster than a speeding bullet or leap tall buildings at a single bound, but he'll look and feel as if he could. Making a difference can be an uphill battle for kids, but with a Deluxe Superman Cape that struggle will be just a little easier. He can slip it on at any time to feel more heroic, even if his young powers are still limited. Outfit your child's Superman costume with this official accessory, and he'll be ready to fight for truth, justice and the American way! Did you find your kid inside of an interstellar space pod? Probably not, but there's still a small chance that your kid is going to grow up to be a superhero! 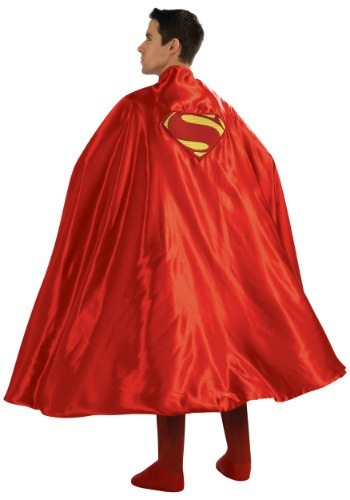 This DC Comics Deluxe Child Superman Costume gives your child an outfit that lets him feel like Kryptonian hero and if he's got any super strength or flight powers hiding dormant inside of him, it might be just enough to coax them out. If not, he still gets a really cool DC superhero costume to wear for parties and trick or treating. After Superman spends a whole day fighting baddies like Lex Luthor, he needs a way to relax. A nice hot bath, followed by a few movies wearing his bathrobe is how he does it. Of course, your day might not be filled super-villain schemes, but that shouldn't stop you from putting on this DC Comics Superman Hooded Robe after hard day's work. When Clark Kent found out that he was an alien from another planet he always wanted to know more. Then one day when he was older he found a ship that contained a hologram of his father who explained that he was from the planet Krypton and that he could be a hero for the human race. His dad even gave him a suit from his home world to wear and now your child can wear the same thing with this Deluxe Boys Black Suit Superman Costume! One thing Superman was known for was his muscular physique. Even if your child hasn't had enough time to develop those muscles, this Deluxe Muscle Chest Superman Costume lets him look like he has! He can look just like the Man of Steel, and send General Zod and his minions back to the Phantom Zone. Then settle down as a reporter for the Daily Planet. 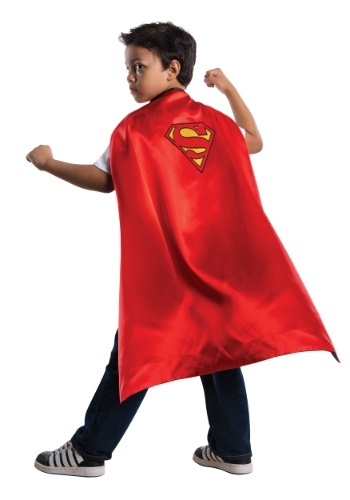 In this Deluxe Child Superman Costume, your son can have Superman's muscular physique instantly! Unfortunately we can't give him the ability to fly or to leap tall buildings at a single bound. You have to be from the planet Krypton to be able to do that. Does your child spend most of his time plotting ways to take down Superman? Does he command a militant regime of Kryptonian fighters? Then chances are, your kid is actually General Zod in disguise. You could just let him go around plotting villainous schemes without the proper costume, or you could do him a solid and gear him up the way an enemy of the Man of Steel should be, with this licensed costume. 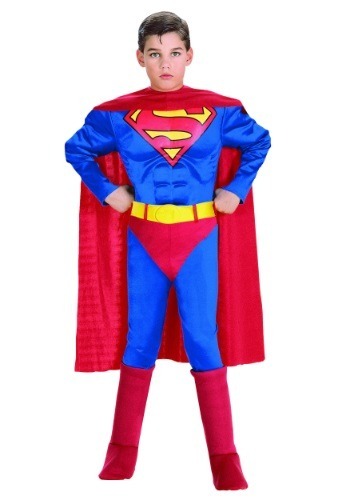 Become the Man of Steel when you wear this Deluxe Superman Plus Size Costume for Halloween. And you don't even have to have Kryptonian DNA or spend hours in the gym to get Superman's buffed physique--the costume provides it! When the planet Krypton was about to explode Jor-El put his son Kal-El in a rocket and sent him off into space to save him. That rocket sent this alien baby to planet Earth where he was found by the Kent family. Jon and Martha raised him as their own, making sure he was brought up to be a fine, upstanding young man. Now your little one can look just like the man of steel when he arrived on Earth! Want to find out if your kid has some super powers hiding inside him? There's a quick test you can do to find out! Just dress him up in this longsleeve Superman t-shirt for kids and see how he does in a fight against Lex Luthor! If he starts flying around the city and shooting laser beams out of his eyes, then he's got super powers. If not, then at least he has a cool Superman shirt to wear around to parties and events! Remember, you are the sole protector of the playground and you have to keep all the bad guys away! This Kids Superman Costume Hoodie will help you look the part especially since it comes with an attached Clark Kent half mask. Now you just have to worry about keeping Lex Luthor and Brainiac away from the sea-saw and monkey bars before they destroy them! I'm sure you can recruit the other playground superheroes to help you! Superman can bench press the entire Earth. It's really no big deal. You might not be able to do that when you wear his suit in t-shirt form, but you might feel a little more super. And Wonder Woman seems to like his look, so you may even sneak a date out of the deal. Your kid doesn't have to fight Doctor Octopus ALL the time when he's wearing this Spider-Man throw. He can wear it while taking his afternoon nap, or while watching movies. Ever Peter Parker takes a little time out now and again when he's not fighting the bad guys. We think your child will be okay he he takes one little nap in this awesome robe. You might not have superpowers like the real Man of Steel, but sometimes, just looking like a superhero is enough to put a scare into bad guys like General Zod and Lex Luther. This Superman t-shirt is just that sort of thing you need. 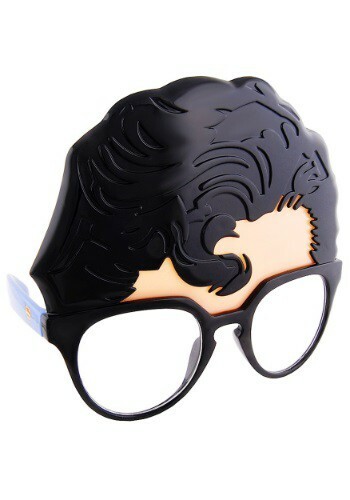 The best part is, if you just put on a set of glasses, you can switch from superhero to secret identity in just seconds. Being a superhero comes in different forms. Sometimes you need to defeat Lex Luthor in an epic battle. Other times, you need to defeat a rumbling tummy with a delicious lunch! 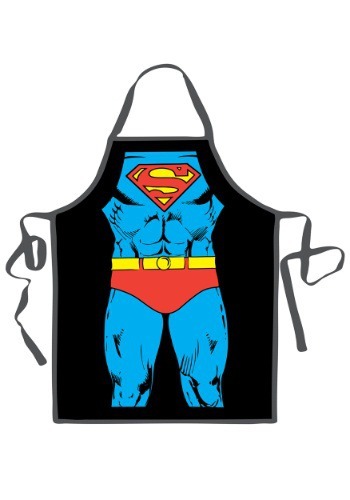 This Superman Character Apron might not help you take down any super villains, but since it's designed after the DC hero, it should help you get down to business when it comes to cooking up some tasty snacks for your friends and family. Sometimes you need to be a superhero at a moment's notice. Actually, most times all you have is a moment's notice to transform from regular Joe into a superhero. That's where this Superman Classic Muscle Chest Dress Up Box Set comes in handy. Just zoom into the play room, dress up, and start saving folks and beating bad guys. This box set will give you enough muscles so you can do any superhero activity imaginable! What does it take to be Superman? Courage, determination, and being born on planet Krypton? Until now we believed these things were the only path toward becoming the Man of Steel. We were wrong. This Superman Costume Accessory Dress Up Set includes everything your little superhero needs. Earth-born kids who become superheros are bound to put the rest to shame! Sometimes pets really do make the best superheros. They're friendly, protective, and know how to fight when they need to. We think that everyone would feel a little more safer with flying, super pets. 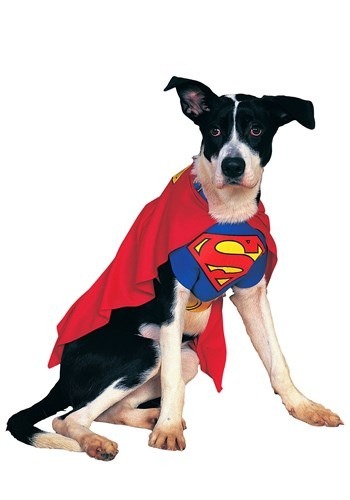 Transform your dog into his favorite superhero with this Superman Dog Costume. Ever wonder how Clark Kent can run, fly, and fight bad guys and somehow his hair magically always stays on point? That must be some sort of sorcery from his home-planet of Krypton, but we have come up with our own solution. Just put on these Superman Glasses so you can see through the eyes of Superman plus you'll have Clark's signature jet-black coif. 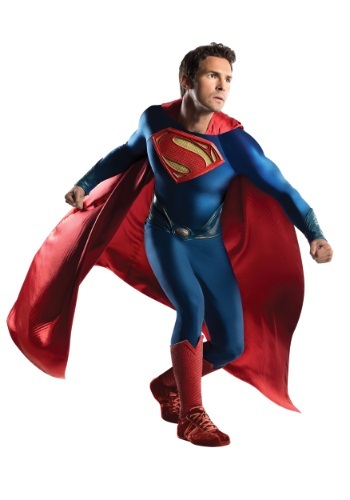 Step into your Halloween party straight from a movie set in this Superman Grand Heritage Costume. Unfortunately this suit does NOT give you X-ray vision or the ability to fly or leap tall buildings at a single bound. But you'll look as if you could! This Superman Man of Steel Muscle Chest Dress Up Box Set includes all of the muscle your little guy will need to look super. With this guy on the job, you'll feel as though the world just became a little safer. Just remember he has an early bed time on school nights, because after it's lights out you're on your own. Superman needs down time too and when he is at home lounging and relaxing he likes to turn to his trusty and comfy robe... the Superman Micro Polar Fleece Robe! His favorite activity when dressed in this robe is eating Cheetos on the couch while watching some news clips of his latest rescue. You may not have Clark Kent's chiseled abs but you can now purchase his cool robe! Superheroes get all the cool nicknames. Clark Kent has Kal-El, Man of Steel and Superman to choose from and all he had to do is dress up in a blue jumpsuit with a giant "S" in front. We've got one that you can wear, but just remember that Superman has real superpowers before you to take on General Zod. You'll look like you just dropped down from the planet Krypton when you wear this Superman Unisex Skin Suit. This cool suit is perfect for men and women who want a sleep superhero look. The included cape simply snaps onto the jumpsuit so you can jet off to save innocent people at a drop of a hat. When danger rears its ugly head in Metropolis it up to one man to save the day! Superman! Now your little one can pretend to be the man of steel this Halloween in this awesome costume. Whether it is imagining to be flying high in the air taking on the evil Bizarro or taking on all of Brainiac's evil robots in a single punch he'll be ready. Be sure to check out our other great Superman themed costumes for the whole family!